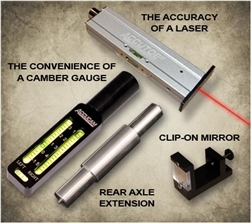 Accutoes laser alignment kit made affordable. The complete kit offers everything you need to align your chassis and set the camber, all in just a few minutes! Kit includes....Accucam camber gauge, Laser level, Precision scale, PRC rear axle extension, Clip on mirror.